This month has been dominated, both emotionally and practically, by the arrival of Angelica’s Big Girl Bed. It has taken up a lot of time, this Big Girl Bed; first, choosing it (I was torn between buying an antique and getting a new one), then working out what else we needed to go with it (any excuse to spend ages on interiors websites) and finally, once the huge package arrived, putting it together. I realise that three is probably quite late to be putting a child into a proper bed (is it? ), but I’m afraid we were in a good place with the cot and we simply couldn’t let it go. It had bars, you see, which meant that once Angelica was in bed, that was it for the night. Not that she ever tried to escape – which was probably why the cot lasted so long – but we didn’t have to worry that she was galavanting about upstairs whilst we were watching Game of Thrones. She was happy with the cot, so were we. I digress; the cot went out and the new bed came in and I had to slip into the airing cupboard of claustrophobic nightmares to have a bit of a sob. (I rarely seem to be able to cry “a little bit” anymore – I hold it all together and then the dam bursts and I am left prostrate with seemingly inconsolable grief.) Where has my baby gone? I wailed, as Mr AMR shouted to ask me where the screwdriver was for about the seventieth time. I remember the day I first put her into the cot, I thought, as I buried my sobs into a stack of mismatched towels, she was so tiny! Six months old! Ugh. Is parenthood always this relentlessly emotional? 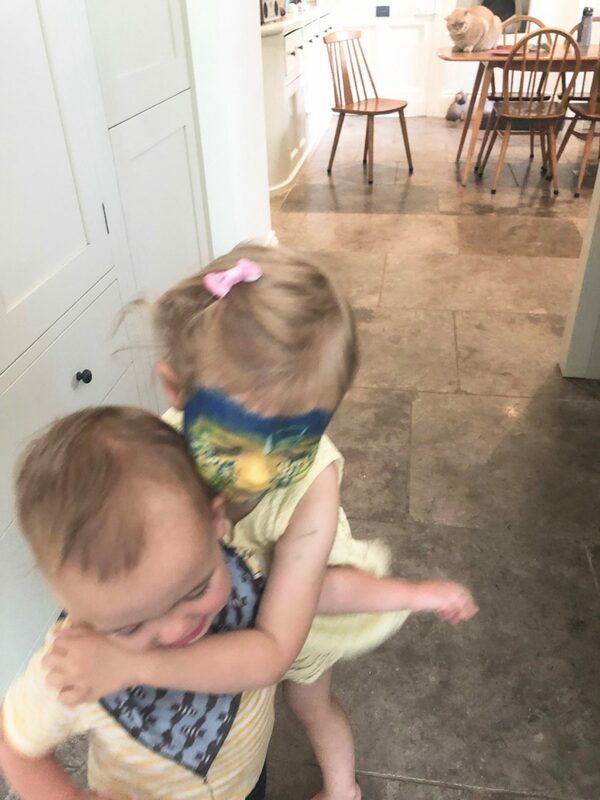 We also had a trip to the nursery so that Angelica could meet her new friends – she starts in September for two days a week – and I had to put my sunglasses on the minute we got through the door because I had welled up and the tears were threatening to spill over. Oh my heart. So anyway, I stuck my sunglasses on and must have looked like a) I had a medical problem with my eyes or b) a total knob. I can’t bear it when people wear sunglasses inappropriately (like in the house, when you’re trying to speak to them, and when it’s winter for God’s sake!) and so you can imagine how much it pained me to keep them on. I only pulled myself together when I leant on a table and accidentally stuck my elbow into a tray of red paint – it’s amazing how a minor crisis can distract you from your own thoughts. 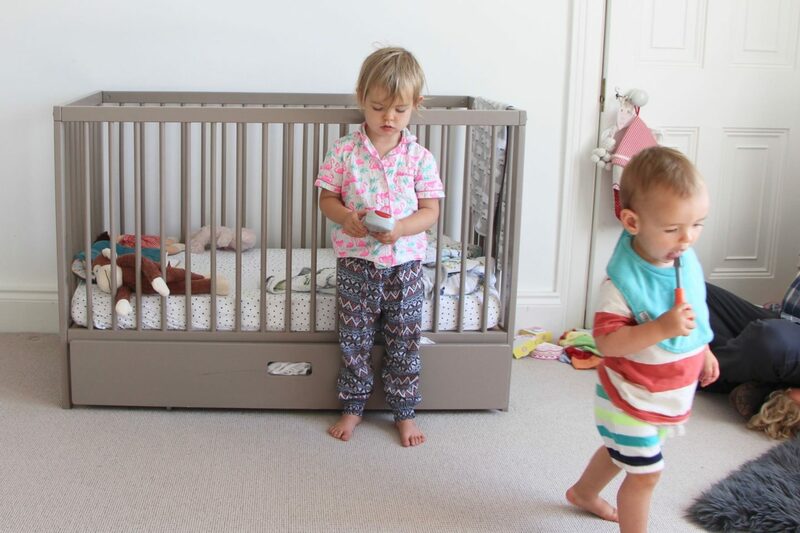 The worst thing about the Big Girl Bed scenario was that Angelica kept crying – “don’t take away little bed!” and in my ridiculous, over-active imagination, the cot became a sort of physical embodiment of her babyhood. There were Angelica’s baby years, all of those milestones and gorgeous memories, standing in pieces on the landing, ready to be stored in the shed. What’s Ted been doing this month? Nothing tear-jerking, which is nice. I’m just about done in, emotionally. He’s eighteen months today and he mostly spends his time throwing his food around dramatically – he sits in his high chair and swipes his hands across the tray from side to side, sending his rice/pasta/cereal/bread flying around the kitchen. Needless to say that Dexter the dog loves him. Ted has a strange way of feeding himself, if I had to describe it in one word I’d have to say “Desperation”. He squashes everything he can possibly manage into his mouth for around thirty seconds, easily devouring over half of his total meal amount, and then he spends a few minutes processing it and chewing it down. He’s like a demented contestant on Supermarket Sweep, packing his trolley in an absolute frenzy. He also gets quite panicked when he starts to smell food and it doesn’t immediately appear – you have to keep him as far away as possible when you’re cooking otherwise he clings to your legs until you drop morsels into his mouth like a baby bird. I’m like a constant snack-provider; dried mango, slithers of ham, lumps of cheese, bits of toast and jam, I’m forever preparing miniature food items, like a caterer for gnomes. Ted has started to say quite a few words, though it’s sporadic and he absolutely will not perform on demand. Ask him to say “moo” or “dada” or “bath” and he will clamp his lips together and stare at you blankly until you go away and leave him alone. Left to his own devices, he chatters and hums and babbles away and has a grand old time of it. Oh, and he has started to love books. A real definite change in the last week or so, I think he’s having a huge developmental leap or something. One day he was a baby dribbling food down his bib, the next day he’s plotting to take over the world, poring over his paperbacks. Although so far he’s only really interested in the farm book because it plays Old McDonald on a loop in a tinny, annoying manner. Ted has also been going through a clumsy stage where he walks straight into doorframes and trips over thin air. And then gets really cross about it. It’s like being in charge of a tiny drunk man who alternates between loving you unconditionally and hating the sight of you. He’s like a tiny drunk man who can’t remember whether he wants a kebab, which is in one direction, or the bus stop, which is in the other. And whilst trying to decide, he likes to lie down a lot, sometimes in the middle of the road. Often he stands on things that just should never be stood on – boxes made from paper, the edges of duvets that have no bed supporting them – and now and then he likes put his hands into drawers and then lean on them so that he traps his fingers painfully. After a short, intense cry, he likes to brush himself off and try it all again. Why am I so silly and overly-sentimental about things? I think I’m trying to get to grips with not having a baby to look after – Ted is becoming more and more independent and there’s no proper cuddle-cuddle time going on. Not like there was before. In one way it’s lovely – I have my arms back! – but trying to adjust to not being needed to much is weird. It’s hard to know who I was before all of the baby years started, and they’ve flown by so fast – it’ll be four years in September since I fell pregnant with Angelica, so four years since I’ve really felt “normal” in my body and had uninterrupted sleep. Where do I go from here? Who am I? A woman who bursts into tears when she’s driving because so many songs remind her of her Dad, who fills her pockets with jelly beans (new vice) so that she can squirrel-nibble on them throughout particularly trying periods of the day, a woman who still feels as much of a girl as she did when she was fourteen and wondered, I wonder what it will feel like to be SIXTEEN? Twenty-three years later and I still have no idea. Time. Life. It’s a funny old thing. Oh Ruth, you write so beautifully! I can read any post on any subject the way you write! Have to say I did have a chuckle when you described Ted as a small drunk man! Please do not think, that I take your baby-related emotions lightly, but you do not know what you do to me with your writing! First, I just giggled to myself- slightly odd since no one else is at home and my neighbors can see me from the garden, sitting at my laptop, lovingly giggling into the screen. Next step was a full force snorting laughter, the ‘being in charge of a tiny drunk man who can’t remember’ did me in. Ruth, such a beautifully written piece! Sums up the emotions of the move out of babyhood so well. My little boy is 3 in September and we’ve only just took the sides off his cot to turn it into a toddler bed, he’d never tried to climb out but we went away for a week and he slept in a single bed with a bed guard and loved it! He’s still in a sleeping bag though (had to buy special extra long ones!). The cuddles come back don’t worry. We get the best snuggles and ‘Duggee Hugs’ off him now. This is how my sister ended up having 5 babies!! I would easily go the same way except that I’m 43 so have decided to stop @ 3 and my last little baby is turning 3 shortly. Your babies will always be your ‘baby’ as long as you live. My youngest baby is will soon turn 45 and she is still my baby. My son is 11 and I have just blubbed my way through him leaving primary school. Seems like only yesterday we packed his cot away. Totally with you there. My boys are 3 and a half and 1. It feels like forever ago, life without them. And yet completely ambivalent. When their not there you miss them like crazy, but when their with you a little alone time with the telly sounds like heaven. Weird and woeful and wonderful. Sorry. I feel like hugh bonneville in notting hill. Oh well done you. Ha ha. Great pics. You Ruth, are a very special person. I am SO glad you’ve written this, my little boy will be 3 in September & although he has a cot bed he’s still in cot set up for the same reasons; I know he’s not going anywhere & he’s happy. I’ve struggled for so long worrying if is it a bit late for him to be in there as until this post I knew of No One else whose child hadn’t already transitioned ages ago after frequently trying to break free. I will also totally be the same emotional wreck, it seems such a small change but it really is such a leap into “big kid” territory & it’s coming way too fast for my liking! It’s all one big adventure with lots of tears but also so much laughter and so many memories. Treasure them all, and sweet dreams to Angelica in her lovely new big girl bed. Oh I love Mr. Bear so inconsequential in the back of the shot! And your kids are definitely taking after the “model look” like mum, with those nice loooonng necks. I’m about to get rid of highcahirs for dining room booster seats (space savers), still feels like another milestone! I have twins so no more babies for me love seeing them grow and their brilliant personalities developing, but oh! Does it have to go so quickly?!? Ah the bath of hormonal tears and unreasoning that is motherhood. Not one person warned me breeding brings madness! Hello Ruth, What a beautiful, emotion-laden post! I cried at points .I’m a 60 year old mother of two grown up daughters (similar in age to you), have four small grandchildren and am a recently retired English teacher. Yes, you’ve made everyone cry! Oh Ruth, you are so lovely. My baby is 9 months old and I’m already looking at newborn photos thinking where did the time go? And kicking myself for dismissing people who said at the time “make the most of it!” Dont get me wrong I love this age,you he’s getting into everything and showing his character. I also sob, could be abundance of bf hormones and impending first period or just motherhood. I’m sure there’ll be plenty more (happy) tears! P.s I still think I’m 4 years old hehe! Ruth did you think about writing a novel, I can bet that it would be a huge success. You have such a wonderful way with words, capturing the poignancy and humour of parenthood – the description of Ted’s antics are simply hilarious! Ruth – today I was shopping in our local Target store and made a pass through the bedding/towels/pillows section, when I heard a University bound young man telling his Mom, “You don’t understand, I need (this, this, this, etc), because I am going to where I am going to be living for the NEXT FOUR Years!. Mom turns around and buries her face in the pillow and starts sobbing – so I started sobbing with her because while my son graduated in 2011, hearing this conversation took me back to the day that he and I had this conversation. Time passes by so quickly -our years are so short with them – but a wise Woman (My Mom), told me that the day our children are born we are getting them ready to be successful adults. It’s like that quote about one day, you’ll hold their hand crossing the street, and it will be the last time, and you won’t know it was the last time. Or one day you’ll shampoo their hair for the last time. I had one a few months ago when my large two year old decided it was more fun to walk /climb to his bed instead of being carried like a babe in arms while I whispered nice things. Now it’s a race with dinosaurs and cars. It’s sad-happy. Sappy. Or the last time you pick them up. Waaaah. Goat goes to playgroup is THE best. More enjoyed by the adults in our house that the one year old but there’s still time! Goat is in a puddle! 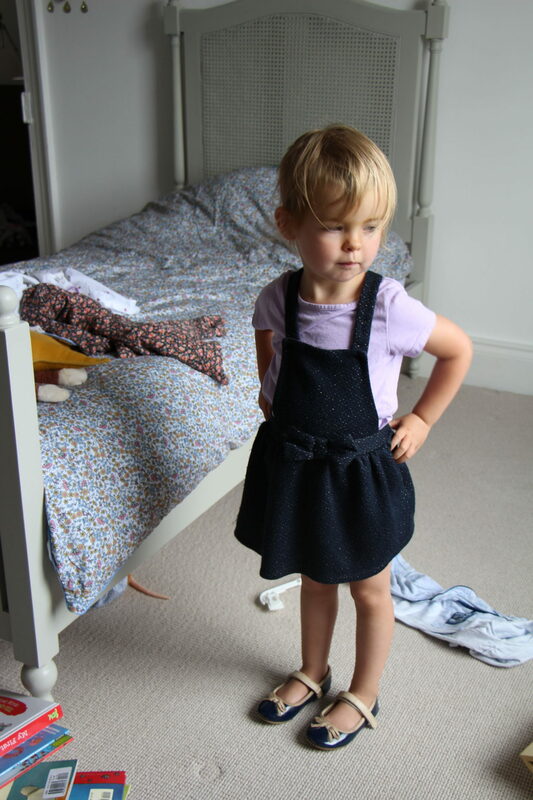 I couldn’t understand when people said they got emotional about their children starting school, and then my eldest started pre-school and watching her tiny face as I left her with a teacher and hearing her say ‘mummy, where are you going?’. I had to wave quickly then when I got out of sight tears rolled down my face. When I went to pick her up, she cried because she didn’t want to go home Lol. The little mare putting me through that torture! Aww, Angelica is so big now, a proper little girl, and is the double of Mr AMR. I can’t even think about the school thing! Do you know what, I would have left it for longer but she is so tall! So it was more of a size thing than anything else. Although she seems to be more keen to go to bed now that she has a big girl bed! Oh wow – congratulations! Are you being landed with lots of the preparations? Another gorgeous post. I was also trying to swallow the tears. I have a five year old niece and a 2 1/2 nephew who sounds a lot like ted. He doesn’t perform (quite right) and saves his words. It’s moo cow? Horsey? Puppy? Treat? And of course Yes or No. He eats 3 weetabix in the morning. The whole packet of froggy faces is shoved into his mouth and then chewed until he’s done, with a very happy face. My niece on the other hand eats her packet one by one saying, hastag happy face or hastage sad face. Pics are fabulous, compliments Mr AMR I suppose? It’s always as hard as it is amazing when they reach a new milestone – or maybe just the ones where you have to get rid of a “baby thing” like the cot or the little bath. 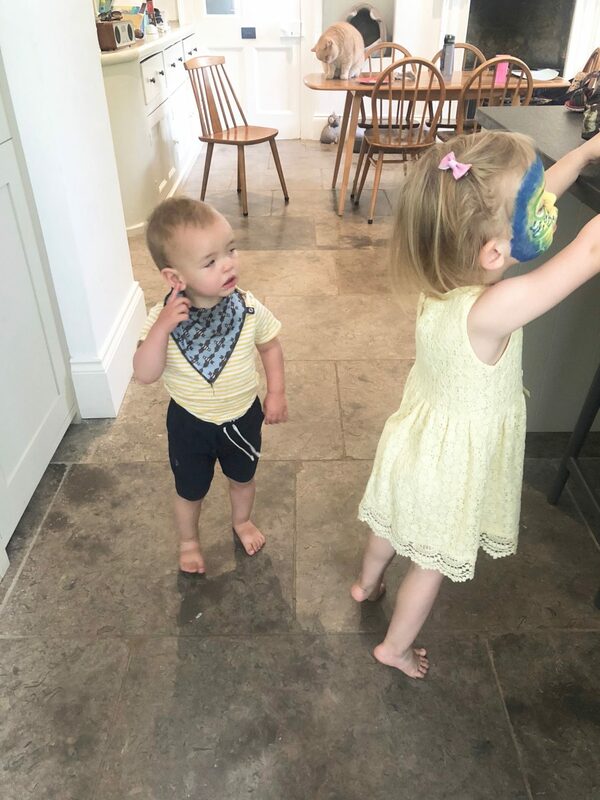 I had the whole two under two thing for a while (fourteen months apart) and I’m really glad that they’re getting older and more independent and brilliant.. etc… BUT I also find it hard when the youngest in particular moves on from the “baby things”. We don’t plan on having any more children so I think it’s because every thing is the last thing! How many times have I said thing?? We will soon be putting our youngest in his own bed and I will probably have a good cry too! Our eldest was in a bed at 13 months. He was a brilliant sleeper, so not phased by the change. I missed putting him to bed (being eight months pregnant with a giant baby doesn’t allow for things like putting baby number one in the cot) so we gave him a big bed so I could sit with him and read him a story. Beautiful post, Ruth. Angelica always sounds and looks so precious! It gets worse! 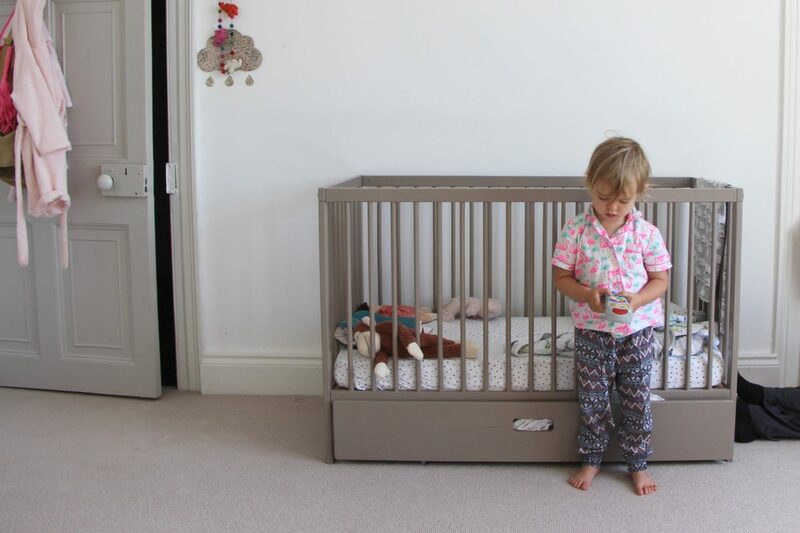 We didn’t have so much trauma moving to our daughter’s first bed as she had one of those bigger cot thingys that turned into a toddler bed – we had to take the sides off as she was trying to climb out! For some reason 11 is hard. My son has a little bit of hair under his armpits and honestly it is hard to think of him growing into a man even when it is happening before my eyes. I hug him more and it helps. Oh Ruth how I love reading your updates! As one of your more “mature” followers, you help me remember all these major changes /stages you are all going through. How lucky you are to have all the photos & a detailed journal of these stages. Keep up the work, you are doing an excellent job!! I understand feeling over emotional about mundane things , I don’t even have kids I have a cat, and for the last 2 weeks she’s decided the mornings are her “alone time” and hides under my bed instead of cuddling with me on the couch and I’m over here like … well isn’t that a slap in the face, and why doesn’t she need me anymore. you big hearted emotional woman! You’ve got me crying now! Oh Ruth, this is priceless. My two are adults now and when people ask which age I liked the best I say “all of them”. As for Angelica at school, when my older one had her first day they said parents can stay in the back if they like. Well, I barely got half down to the kiddie sized chair and my daughter ran over shouting, “you’re not staying, are you?” It all works out. Watching them grow is a gift. Suwu said my thoughts already, perfectly. Also, I do love your writing, Ruth. Thank you.